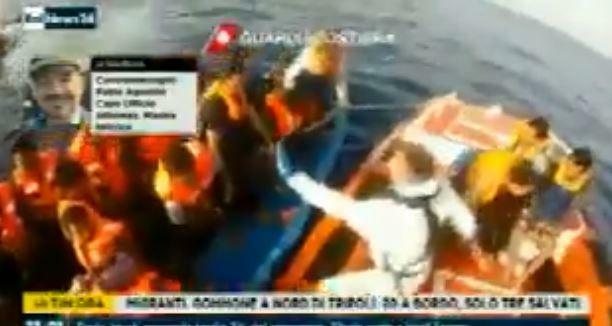 A screen grab of the rescue. Three migrants died and about 15 were missing off the Libyan coast, the Italian navy said Saturday, after staging a rescue operation in the Mediterranean. The navy intervened on Friday and a helicopter rescued three people suffering from hypothermia who were flown to the southern Italian island of Lampedusa, Admiral Fabio Agostini said. This was after Italian air force pilots "spotted a dinghy in distress carrying about 20 people," he told Italian television in an interview tweeted by the navy. According to the International Organization for Migration (IOM), 83 people have died so far this year trying to cross the Mediterranean. Sea Watch said on Friday it had picked up communication about the ‘distress case’ but a merchant vessel nearby was not responding. In December, two vessels were stranded in Maltese waters after rescuing 49 migrants. After a few weeks at sea, the Maltese eventually allowed them to disembark.